12 inch Oregon low-kickback bar and chain for smooth and fast cuts. Automatic oiling system for constant lubrication of bar and chain. Tool-less chain tensioning for fast and easy adjustments. Full wrap around handle for comfortable cutting in different orientations. Battery state of charge indicator. Part of the 40V MAX* outdoor system. 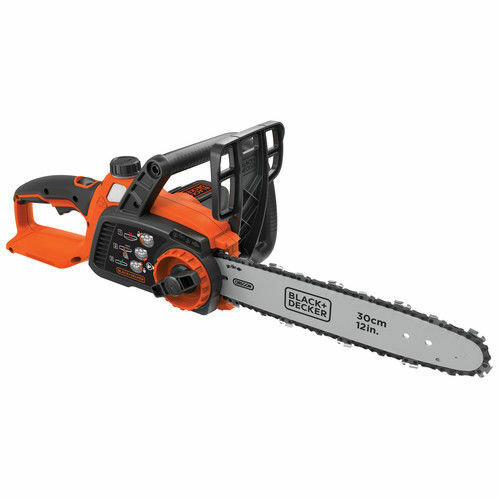 I gave the chainsaw 2 stars not because of the.quality but because it did not come with a battery even though the details state \"it features a 40V MAX Lithium Ion battery for longer runtime and overall life- It stays charged up to 5X longer.\"The manual which came with the chainsawstates on page 8 \"The standard charger provided will charge a fully depleted battery in about 4-5 hours.\"This would have been a much better value if it had come as advertised. 12 inch Oregon low-kickback bar and chain for smooth and fast cuts. Tool-less chain tensioning for fast and easy adjustments. Automatic oiling system for constant lubrication of bar and chain.